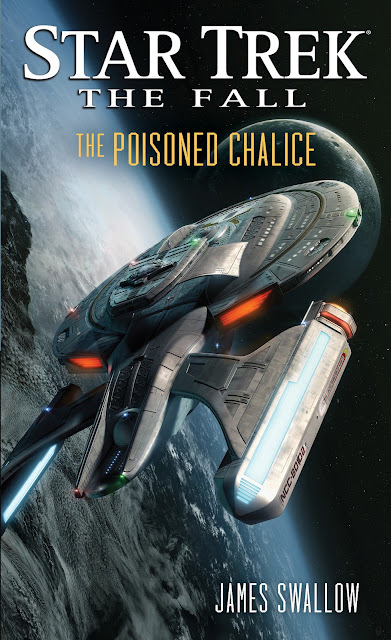 StarTrek.com have revealed the beautiful new cover for James Swallow's forthcoming new Titan novel, and the fourth book in The Fall series, The Poisoned Chalice. The cover uses Tobias Richter's brilliant new model of the Titan (which you can see more of here); check out those ample nacelles! One simple act, and the troubles of the United Federation of Planets have grown darker overnight. The mystery behind the heinous terrorist attack that has rocked the Federation to its core grows ever deeper, and William Riker finds himself beset by rumors and half-truths as the U.S.S. Titan is ordered back to Earth on emergency orders from the admiralty. Soon, Riker finds himself drawn into a game of political intrigue, bearing witness to members of Starfleet being detained—including people he considered friends—pending an investigation at the highest levels. And while Riker tries to navigate the corridors of power, Titan’s tactical officer, Tuvok, is given a series of clandestine orders that lead him into a gray world of secrets, lies, and deniable operations. Who can be trusted when the law falls silent and justice becomes a quest for revenge? For the crew of the U.S.S. Titan, the search for answers will become a battle for every ideal the Federation stands for. The Fall got off to a brilliant start this month with David R. George III's Revelation and Dust. I'm sure we're in for an exciting time as the series unfolds.